some of my valentines decorations i made..
i made the little ornaments on my valentines tree out of valentines paper, wooden hearts, pipe cleaners and a sprinkle of mica flakes. i thought they were kinda sweet. So cute, you are just too dang crafty! Happy Valentines Day. You have a Valentines Tree! CUTE! Happy V-Day! They turned out darling. I need to know where you got the letters. Darling red tree. I love the silver pipe cleaner with the vintage valentine paper. Perfect. 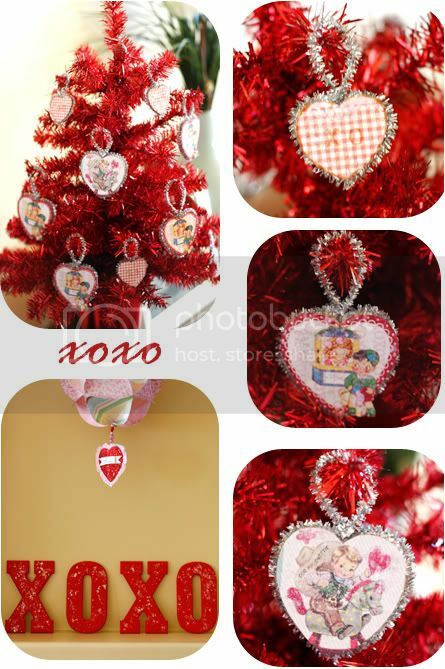 Cute decorations, did you make the XOXO letters as well? I’ve been looking for something like that. so so cute! You are so creative… I hope you have a happy love day too! thanks for all the nice comments. yes, i did make the xoxo letters too. i just bought some wood letters at the craft store and painted them red and threw some mica flakes on top. a quick project!